Bulkheads and other hard armor have a limited life span. If they are built at the high-tide line, they are continually battered by waves and drift logs. If they are set farther back, they are still subject to storm damage. Either way, pressure from the slope behind them and the scouring action of the waves in front of them will eventually make them unstable. Gradual decay and disintegration are also inevitable. Homeowners with a cracked, rotting, or collapsing bulkhead face the decision of whether to repair the structure, replace it, or remove it altogether. 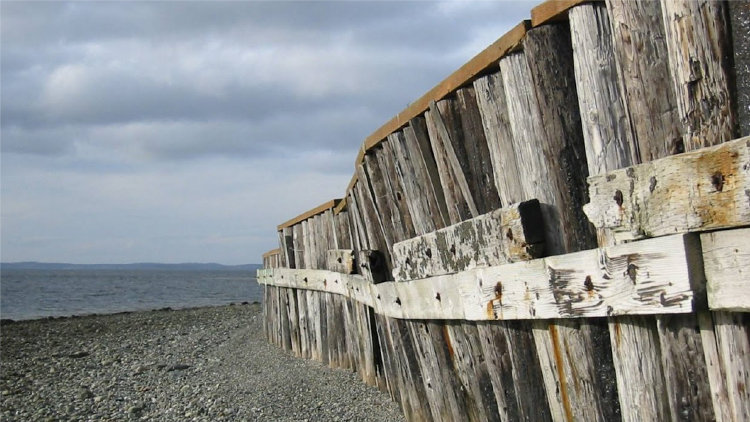 In many places, soft shore protection that mimics nature is a desirable option. All bulkheads eventually decay and need to be removed or replaced. Pressure from the slope behind a bulkhead will eventually make it unstable. Beaches with bulkheads are often walkable only when the tide is low. Bulkhead repair usually requires a professional contractor and a permit, especially if the work involves significant modifications, equipment or materials on the beach, or excavation. You also need a permit to replace a failing bulkhead. In certain emergencies—such as when a bulkhead failure puts a home in imminent danger—you can temporarily bypass the usual permitting process. A more permanent replacement will be subject to the same regulations as a new bulkhead, however—it will be allowed only if you can prove that it is necessary to protect a house or other structure and softer shore protection is not feasible. Bulkhead damage or failure often leads property owners to consider removing the structure altogether. 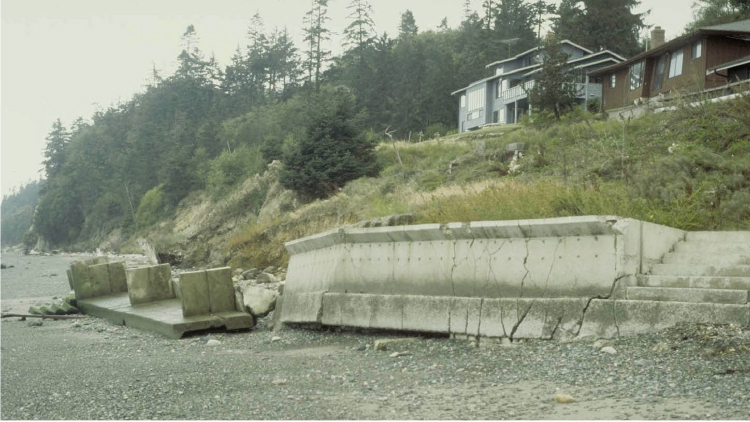 Hard armor refers to any erosion-control structure on the waterfront, including a concrete or wooden bulkhead, rock seawall, retaining wall, or revetment. You’ll often see bulkhead and hard armor used interchangeably. 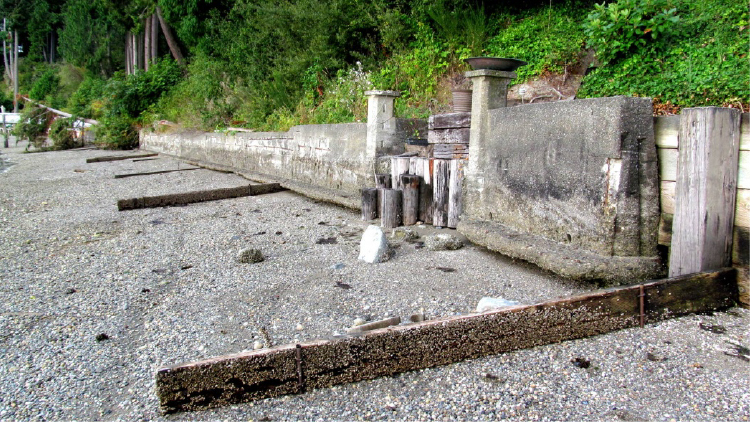 In the Puget Sound area, where erosion rates are often low, many bulkheads are coming down because they can be safely replaced by soft shore protection—or simply a natural beach. A number of successful bulkhead removal projects on public and private beaches have shown that this option is not only feasible but can result in a more attractive, accessible shoreline. In some places, neighbors have joined together and had their hard armor removed all at once. This approach has many advantages, including lowering the cost per household for site inspections, planning, contractor services, and site restoration. It also ensures that bulkhead removal on one property does not harm the adjoining sites. The cost of removing a bulkhead depends on the site’s characteristics, the type and amount of material to be removed, and the measures needed to stabilize the site afterwards. In general, removing a bulkhead costs much less than replacing it.